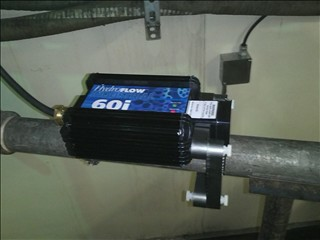 HydroFLOW West Inc. - HydroFLOW Master Distributor in the US Pacific. Chemical Plant in Wapato, Washington, USA. 600 and 700 horse power low pressure diesel steam boilers. One HydroFLOW 60i unit was installed on the water line, after the softener, which provides make-up water to the DA tank. Two HydroFLOW 60i units were install on the incoming water line feeding each steam boiler. Well water with a hardness of approximately 200PPM of calcium carbonate. Note:The water softener reduces the hardness to around 80PPM. Anti-scalant, anti-corrosive and iron inhibitor chemicals. Due to excessive lime scale accumulation, the diesel steam boilers were on the verge of being decommissioned for a week in order to be acid cleaned; a process which typically costs over $15,000. In addition, there was a strong possibility the steam boilers required replacement ($350K each). The head of maintenance decided to evaluate HydroFLOW’s ability to clean the steam boilers and possibly avoid acid cleaning. Remove scale deposits from the steam boilers, DA tank and pipes without the need to acid clean and lose a week’s worth of production time. Within a few days, soft chunks of grayish and reddish scale and “putty” (wet calcite crystals) began washing out via blow-down. ​Immediately following installation and after consulting with the manufacturer of the steam boilers; the maintenance supervisor increased blow-down frequency to every two hours for the initial 2.5 months. Increasing the blow-down frequency accelerated the removal of scale deposits from the system. Currently, the steam boilers are being blown-down 3 times a day. The water softener was bypassed less than a month after installation, which led to acceleration in the removal of scale from the system. Chemicals are yet to be reduced. Note: Following a water analysis by a HydroFLOW representative, some chemical reduction can be achieved. See below Steam Boiler Questions & Answers and Water Test Requirements for additional information. Within 2.5 months, the stack temperature of each steam boiler reduced from approximately 650 to 400 degrees F, indicating increased efficiency. Within 2.5 months, fuel consumption went down from 400 to 275 gallon per day; which translates to roughly $150K savings annually (return on investment of 2-3 months). Due to the great results, the customer decided to delay the possible replacement of the steam boilers ($350K each).